Infographic elements is one of the most popular and understandable ways of presenting information. Both kids and adults love a great illustration of facts and figures. For designers, however, infographics may pose a bit of a challenge. Very often, these designs contain a lot of intricate elements like charts, graphs, numbers, etc. The need to present lots of statistics in a fun and catchy way is what makes designers to look for help. Why Do Designers Need Infographic Elements? The categories include: food, holidays, business, shopping, cars, computers, software and more! Feel free to add and remove elements, cut, crop, recolor and resize them keeping the quality intact. Mix and match the elements from any given set to get the perfect look for your infographic. 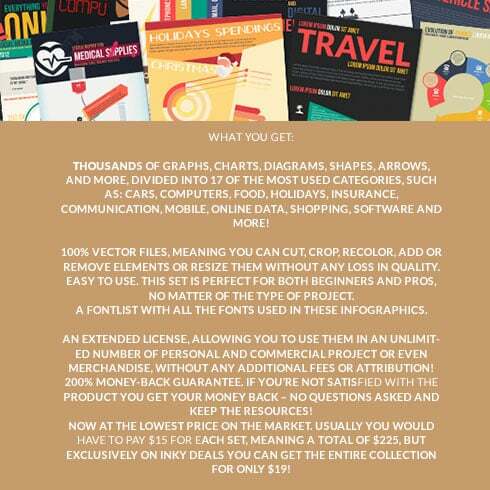 Fontlist includes all the fonts utilized in the infographic templates. Apart from being easy to use, these infographics come with an extended license. Feel free to use them without limit in both personal and commercial projects. No extra fees or attribution! Get the hold of these exclusive infographic elements to create eye-catching and unique designs easily! Define a graphic bundle deal? If you are a artist taking care of many tasks concurrently, you see the importance of the entire pack of design components at hands. Searching for them separately, you spend whole lot more time and cash consequently. 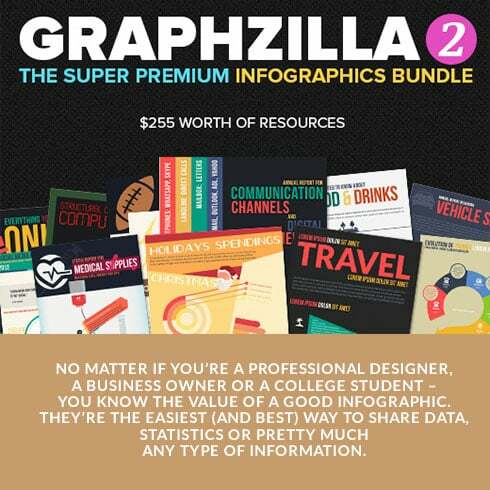 To obtain every one of the desired elements in a single package, we suggest trying graphic bundle deals. A bundle is actually a selection of elements required for graphic design, valued for a large amount of money, yet offered at a discounted price for a short time. Ways to save a whole lot more funds on MasterBundles.com deals? Are you looking for a 5% extra discount on any package from MasterBundles.com? All you need to do is simply share the web page with a package deal on social websites (Facebook). When done, the price cut will be instantly added to your current cart. Are deals of any use? The benefits of graphic package deals for web designers are usually pretty evident. However if you are new to them and still have questions, the subsequent info will be useful for you. Including a great number of the components in a single package, the collection provides you with a chance to use different of them for many different projects. Besides, the cost is typically greatly reduced which allows you to stretch your budget, yet get the whole set priced at hundreds of dollars. The collections of components compiled into a graphics package are typically sorted based on their kind and purpose. There can be deals with mockups, wedding invitation templates and infographics, etc. In addition, you may also find graphic bundles tailored for St. Valentine’s Day, Halloween or Christmas. MasterBundles could offer you a big variety of unique bundles. MasterBundles sells not only graphics packages but additionally about 20 other various kinds of items. Fonts, WordPress themes, mockups, icons, photos, illustrations, presentation templates and much more – on the MasterBundles.com it is possible to find all the items, necessary for a design project creation. The watercolor graphics bundle is a bundle containing pics and illustrations painted with watercolors. They will fit for a range of businesses, such as food distributors, perfume, fashion and cosmetics. Themed wedding invitations or cards could also be constructed with this kind of bundle. You thought all you need to have a popular and prosperous Instagram account is just to publish a few nice pics? To seduce followers, your Instagram feed should look gorgeous and fascinating. Instagram design templates will let you achieve that goal and help to make your Instagram content captivating and recognizable. Accumulated into packages they might be purchased for a lower price. Articles on blogs which come with infographics are usually more legible and well-liked than those that don’t. 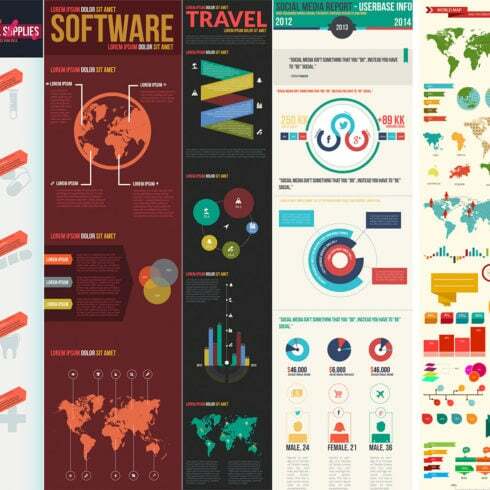 A package for infographics is most effective as it offers a ready-made option. The artist just has to mix the illustrations and voila! The graphic designers who like to do business with photographs will be notably excited about the photo overlays graphic bundles. They consist of selections of elements of design intended to enhance and modify the photos. Such kind of components is often placed over the images to produce some fresh and interesting look. MasterBundles includes a large set of bundles, packed with photo overlay components. MasterBundles is a site that gathers best deals from the internet and lets you buy the elements you’ll need in your design work for a lower price. Bundle deals this fabulous website carries are restricted in time, and that is the answer why they are so inexpensive. To avoid missing the sale you will be really excited about – join for the weekly email newsletter, showing you the most recent deals. MasterBundles also has a great blog with the helpful design features explained.